Colonel John F. Troxell first asserts that there is a false dichotomy being drawn between capabilities-based and threat-based force planning. He argues that post-Cold War force planning must be founded on a logical integration of threat- and capabilities-based planning methodologies. He then addresses the issue of the two Major Regional Contingency (MRC) force-sizing paradigm. 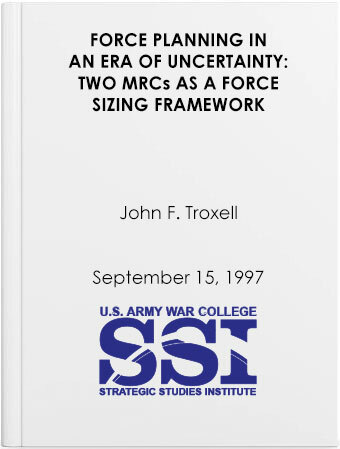 After reviewing all the arguments made against that paradigm, Colonel Troxell concludes that in a world characterized by uncertainty and regional instability, in which the United States has global security interests and a unique leadership role, the two MRC framework constitutes a logical scheme for organizing U.S. defense planning efforts. That framework is also flexible enough to accommodate adjustments to the U.S. defense establishment, both today and for the immediate future. New approaches to planning scenarios and the operational concept for employing forces offer the potential for such adjustments concerning the "ways" of the strategic paradigm, while force thinning and modernization are two important categories for adjusting the affordability of the strategic "means." At some point, changes in the international security environment will demand significantly different approaches to shaping U.S. forces. But, given the QDR's ringing endorsement of the two MRC construct, that change will be a 21st, rather than a 20th, century undertaking.